Scott Lobdell's Red Hood and the Outlaws Vol. 2: The Starfire demonstrates the versatility of this title in a way that ought to suggest good things going forward. But Lobdell tells a familiar story, and despite a welcome tweak here and there, the book remains mostly predictable. The last volume of Red Hood saw the team take on undead ninjas and giant monsters; the story was not "earthbound" in the "fighting crime in Gotham City" sense, but neither was it too far afield from what one might normally find among the Bat-titles. Starfire begins with the Red Hood versus mobsters, then a "Night of the Owls" crossover, then a four-part trip to space, and then a run-in with Superman. None of these stories feel out of place for the characters, and in this way Lobdell demonstrates the breadth of stories this series can tell. This genre-bridging is not something that could be comfortably done with another Bat-book like Batgirl or Batwing. In this way, Red Hood and the Outlaws is largely reminiscent of Marv Wolfman and George Perez's New Teen Titans. That's a comparison that might give some purists pause given Lobdell's controversial recreations of both Starfire and Arsenal, but it's apt. The strength of Titans was that with Nightwing, Starfire, Raven, Donna Troy, and the rest, Wolfman and Perez could easily pit the Titans against the HIVE, but also send them to the alien planet Tamaran, or the mystic dimension of Azarath, or pit them against the gods of myth. Lobdell has not such a far-reaching cast here, but neither did Red Hood and Arsenal look out of place fighting alien hordes alongside Starfire, and this suggests a trip to Azarath or Olympus would work equally well. But in the broad strokes, Lobdell is telling a story that Wolfman and Perez already told, and that we've seen versions of in different media since then -- Starfire returns to Tamaran, she fights her evil sister Blackfire, hilarity ensues. This is a problem endemic to the New 52 as a whole; in an attempt to keep DC's new universe relatively like DC's old universe, a number of origins remained relatively the same, and that inevitably lead to telling the same stories over again. What I never wanted to see with the New 52 was someone trying again to tell "Great Darkness Saga," for instance, and having it come out poorly (which had been the case once before); in the same way, watching Starfire battle Blackfire again "for the first time" doesn't hold my interest as well as if Lobdell had given Starfire an entirely new origin, making the character his own. Lobdell does offer a good twist in making Blackfire Komand'r good, rather than bad; the story plays to expectations in the first two parts, and then reveals Blackfire to be on the side of angels in the third. I appreciated this -- just when I felt the story was too predictable, Lobdell goes against expectations just slightly. 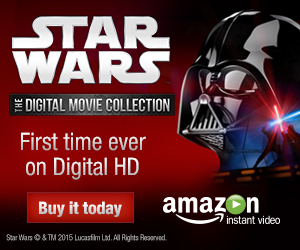 It may be too slight, however; I'd still argue the broad strokes of the story are the same. Also, Lobdell's four-part "Starfire" story lacks some suspense; the Outlaws go to outer space, they battle Blackfire and the Blight, they win, they go home. Other than to flesh out Starfire's twice-told origin, not much of consequence happens in this story. One interesting character bit is how Lobdell tries to deepen the relationship between Starfire and Arsenal in this volume. The move is a little sudden and one might wonder if it's at least in part due to the backlash Lobdell received for Starfire's incidental sexuality in the first volume. If sudden, though, it works, in part because of the way Lobdell plays against type -- Starfire takes the dominant, stoic (stereotypically male) role in the relationship (which arguably she did not have in New Teen Titans with Nightwing) while Arsenal is more doting and emotional. Lobdell's Arsenal is such a goofball that it's like watching Starfire have a relationship with Changeling, which is weird (one would sooner imagine Starfire romantically involved with the late 1990s Arsenal than this guy); but the fact that they care for each other in a relatively straightforward and uncomplicated way is refreshing given, for instance, how fraught Superman and Wonder Woman's relationship is. Lobdell also cleverly brings back Isabel, the stewardess who Red Hood Jason Todd chose not to date last time. Lobdell wisely skips what inspired Jason's reversal and instead simply gets on with it; Isabel's presence in the "Starfire" story offers a good "real person"'s counterpoint to the superheroics. As I've said before, what sells Lobdell's Jason Todd is precisely his interactions with Isabel before and now; whereas the Red Hood is a master take-no-prisoners assassin, without the mask Jason stammers over his words on a date with Isabel. That the Outlaws are not just human, but actually a tad inept outside of their superheroics, can't help but endear them to the reader. The rest of the book is enjoyable -- especially as drawn by Kenneth Rocafort -- but again, without a great amount of suspense. The highlight of the first issue, leading in to the "Night of the Owls" crossover, is the revelation that Jason Todd and Tim Drake have a friendship kept secret from the Bat-family; this raises my esteem of both characters to see them palling around in a way above Bat-family politics. The final Superman issue is the book's main rough patch, in which the joke that everything the Outlaws throw at Superman fails goes on too long. The issue might also be construed as passing the time until Outlaws can line up with "Death of the Family"; while I understand the necessity, the issue doesn't distinguish itself otherwise. I remain optimistic about Red Hood and the Outlaws. Though the characters (namely Starfire) were ill-formed in the beginning, there's a madcap Three's Company bent to the group now; Outlaws is a title with serious superheroics but that doesn't take itself too seriously. As Red Hood and the Outlaws Vol. 2: The Starfire demonstrates, however, this is still a book in search of a strong story; after Scott Lobdell gets past "Death of the Family," hopefully Outlaws can start to do more of its own, new thing. 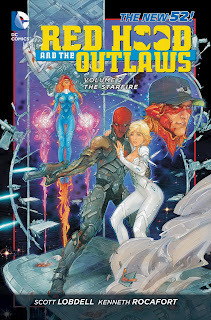 A review of Red Hood and the Outlaws Vol. 3: Death of the Family, coming up next. So is Starfire as degradingly sexual in this issue? No, I wouldn't say so. What I found interesting about Vol. 2 -- and I stated this in part above in my review -- is that Scott Lobdell proceeds to actually build a relationship between Starfire and Roy in this book. Yes, Starfire propositioned Roy outright in Vol. 1, but it is not as though she's continued to proposition every other male character that's appeared in the book since; she solely propositioned Roy, and then has been monogamous with him through Vols. 2 and 3. Might we interpret this as Lobdell backpedalling given the controversy with the first volume? Sure, we could. But Red Hood Vol. 3 actually delves a bit more strongly than the series has so far into this idea that Starfire is an alien and not like us, which I think is an interesting concept; what's to say that all DC Comics aliens have exactly the same sexual morality as humans do? It makes sense to me that Starfire is a member of a warrior race that might "shoot first and ask questions later," if you know what I mean, and I don't think that's so far from how I've seen the character portrayed in other comics series. Starfire's introduction was indeed mis-handled in that this idea of "otherness," which is what I think Lobdell was going for, wasn't present enough before Starfire propositioned Roy; I also think the controversy took on something of a life of its own in that people thought Lobdell took the sweet, innocent Starfire of the Teen Titans cartoon and turned her into a buxom boy-toy, which completely ignores the historical context of the character prior to the current day. For me, while again I thought the introduction of Starfire in the first volume of Red Hood was mis-handled, I had to decide whether it would put me off the book entirely, or if I could get over it enough to keep reading and see if there were other aspects of the book I liked; I chose the latter. There's sufficient digging into the how and why and what of Starfire's initial portrayal that the reader can do that I was inclined not to dismiss the series out of hand, but rather to stick with it, like the parts I liked, and try to understand what Lobdell was going for when there was something I didn't like.